Your proposal’s been accepted. Now it’s time to collect. Kaching! Woohoo! You’ve written a proposal and your client accepted it. OK, now how do you deal with the whole this-could-be-awkward process of actually collecting money? Yes, you can send them an invoice, but how will you actually get paid? Oftentimes collecting money can take you away from your more important tasks – like finding more clients, finishing other projects, or doing the work you were hired to do. Getting paid is, of course, crucial to your business, but it doesn’t have to be a messy, stressful or painful process. 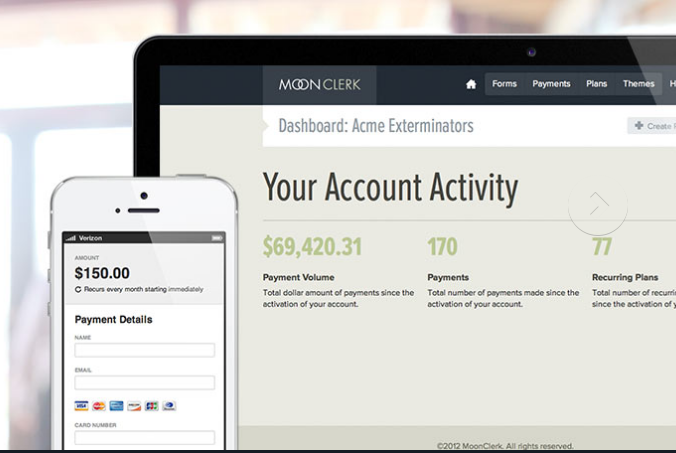 Today we’re featuring MoonClerk, an online payment solution for service providers that makes it easy to automate your billing process and get rid of some of that stress. Today we’re offering a few tips for improving your entire payment process using MoonClerk in conjunction with QuoteRoller. Instead of waiting for your client to send a check or sending them a way to pay after they’ve accepted your proposal, what if you could add a payment link right inside of the proposal? Better yet, what if you were able to embed the entire checkout process within the Quote Roller proposal you’ve prepared for them so they never even have to leave the proposal? Could that get you paid faster? Sure. With MoonClerk, you can easily create a payment form for each of your customers (or reuse the same one from within your content library, again and again) and embed it inside a Quote Roller proposal. You can even style the payment form to match the look and feel of your proposal with the branding of your company. With MoonClerk, you can charge your clients for one-time fees or recurring fees. You can even set your clients up on payment plans with specific end-dates. When you use automated recurring billing, all you have to do is set up the initial payment schedule, have your customer “check out” once, and then MoonClerk takes care of charging their credit or debit card every time their payment is due. It’s as easy as sitting back and watching the payments come in on your customers’ pre-determined billing dates. Late payments can have a significant negative impact on your business’s cash flow. They can also have a significant negative impact on your relationship with your clients. Nobody likes being charged a late fee and it can be awkward trying to collect one. Using an automated payment solution keeps payments on-time and allows you to focus on growth rather than potential cash flow or customer relationship issues issues. However, if you have a client on retainer or a recurring payment plan, sometimes their credit card may be declined – it may be that it has expired, the customer got a new card, or a variety of other reasons. Using a system like MoonClerk can make it easy for you to handle this situation by letting you know when a customer’s card has failed and giving you a way to quickly update their credit or debit card information. Keeping track of who’s up-to-date with their payments and who’s not can be confusing. By automating your billing process and having client’s either pay up-front when they accept the proposal or pay through a recurring plan, you can eliminate a lot of this confusion. Rather than sifting through paperwork and emails, you can quickly look at MoonClerk’s dashboard to see what’s happened with your client’s payments and what’s scheduled to happen in the future. You can also change a client’s recurring plan and payment info, give partial or full refunds, and have automatic receipts sent to them after they pay. Good luck and make sure to visit MoonClerk to learn more about what they have to offer!